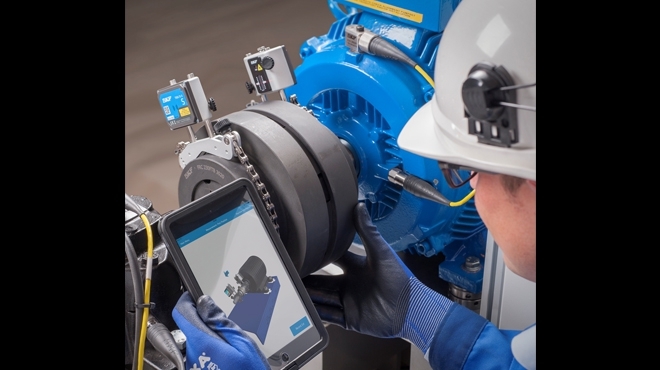 SKF announced the introduction of its SKF shaft alignment tool TKSA 71. Designed for professional alignment in harsh industrial environments, the TKSA 71 provides superior alignment performance and long service life. The tool’s easy-to-use, dedicated software applications enable different types of alignments: shaft alignment, soft foot correction, vertical shaft alignment, spacer shaft alignment, machine train shaft alignment and dial gauge values. Its innovative instrument design offers high measurement accuracy and excellent protection against dust and water. The versatile TKSA 71 also has ultra-compact measuring units for use in narrow spaces. Suitable for a wide range of applications, the TKSA 71 is offered as the base model with standard accessories and a rugged case that meets airline standards for cabin luggage. The TKSA 71/PRO includes additional accessories for more demanding applications and is supplied in a larger, rugged trolley case. Models TKSA 71D and TKSA71D/PRO include a display device with protective cover and pre-installed apps that are ready to use without Internet connection or account setup. The TKSA 71’s software apps are designed for intuitive use without prior training and are available free of charge for both Android and Apple iOS platforms. Common features include comprehensive, automatic reports, export and sharing options, instructional videos within the app, built-in tolerance guidelines, disturbance compensation, 3-D live view and a fully functional demonstration mode.